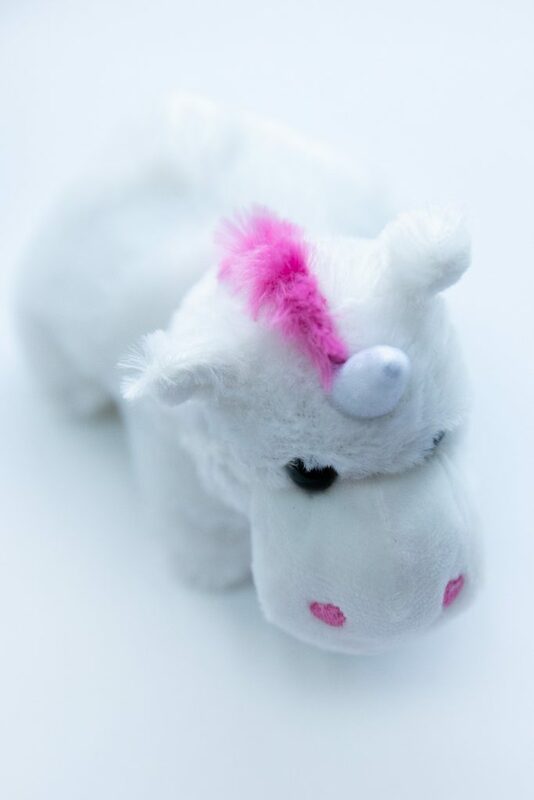 I don’t know why, but little girls LOVE UNICORNS (most of them anyways ha!). 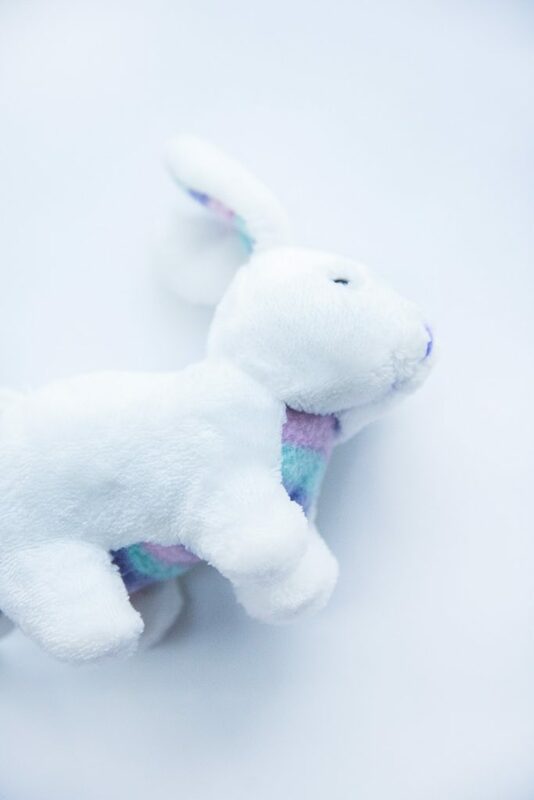 These magical creatures make a perfect snuggly basket stuffer. 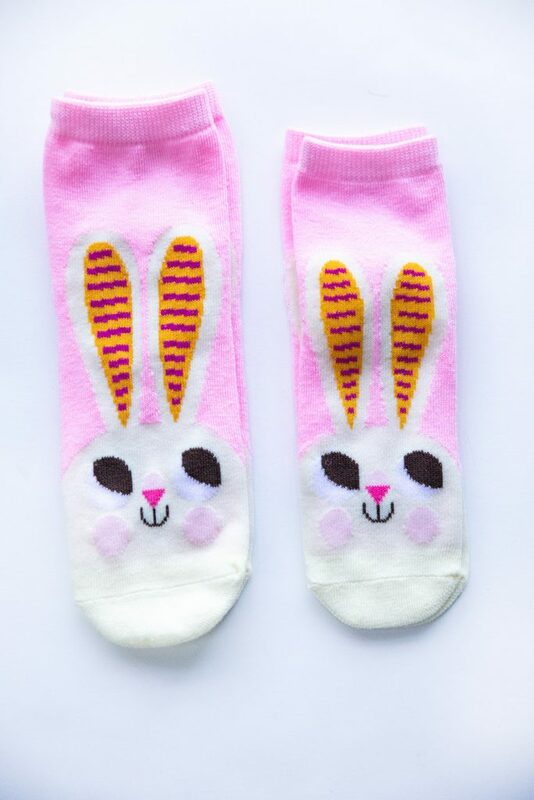 I also threw in a small bunny because – well , what’s Easter without the Easter Bunny, of course! I try and limit my toddler’s sugar intake. Not only is an overload of sugar extremely unhealthy, but I’m not dealing with the repercussions of a child bouncing off the walls. Can you say sugar aftermath? Lol. 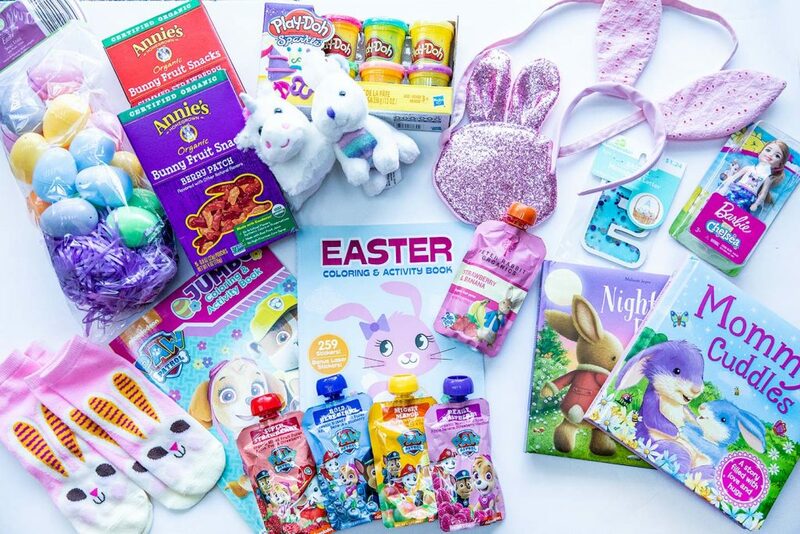 There are so many healthy options out there you can give your child instead. 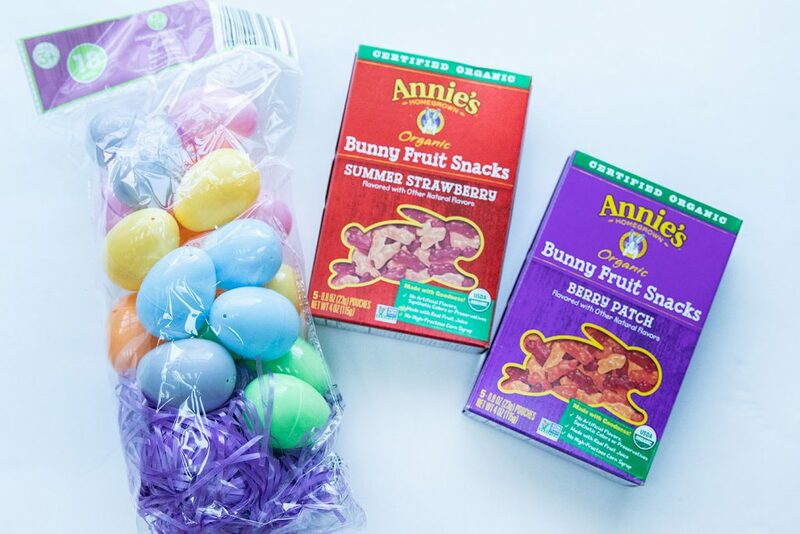 Annie’s has a great line of organic snacks, everything from cheddar bunnies to gummy snacks. 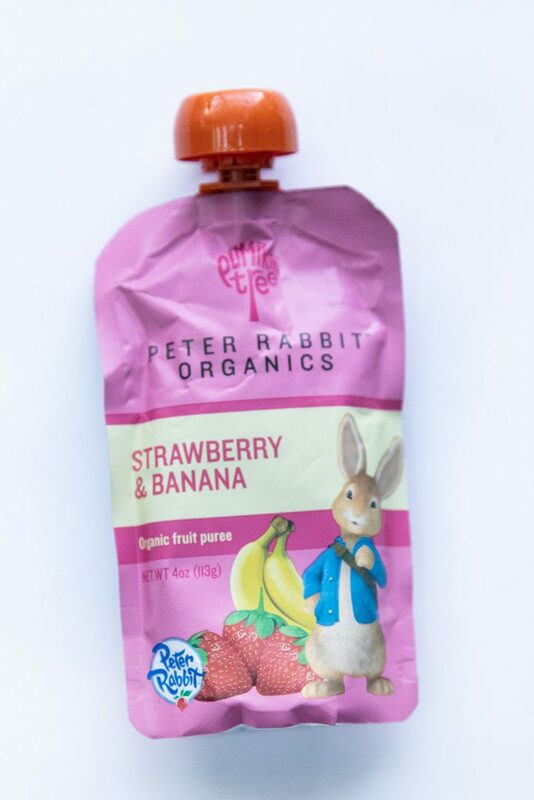 Peter Rabbit Organics has fruit and veggie pouches that are packed full of nutrition and make for a wholesome option at snack time! 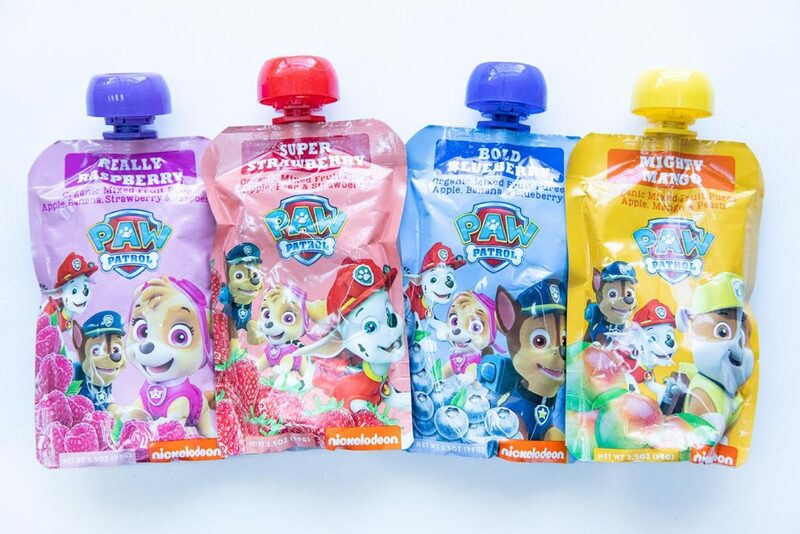 I also came across Paw Patrol Pouches that are the perfect mix of yummy organic fruit. 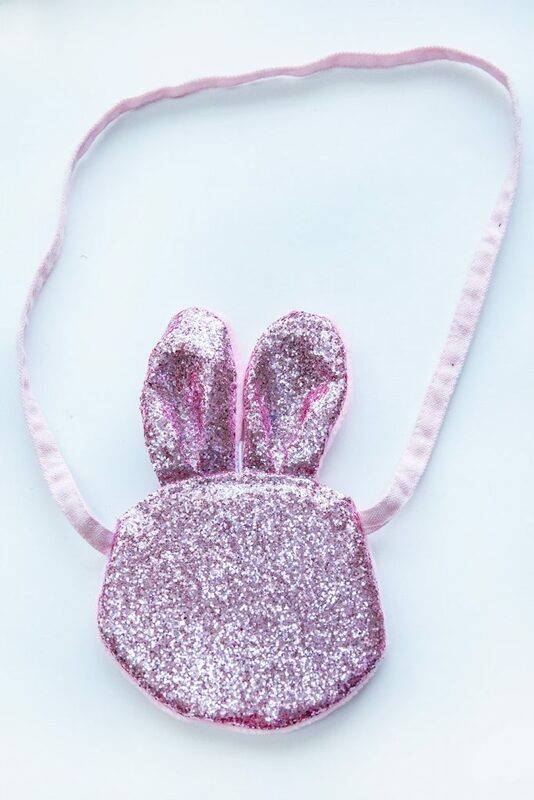 These squeezy pouches are great for pulling out of a bag or popping in a lunchbox. And are super convenient!! 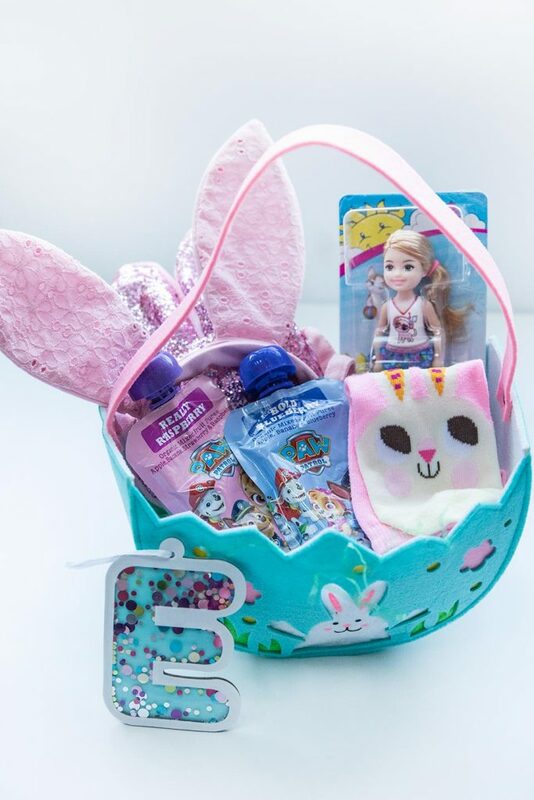 Baskets always need to include some fun items! 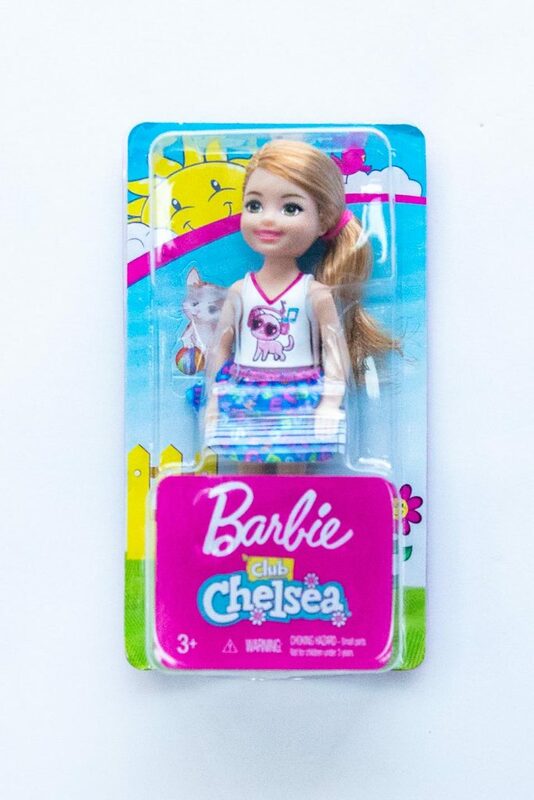 I found the Barbie Chelsea doll and thought it was small and cute – the perfect little doll basket stuffer. Did someone say PlayDoh?! 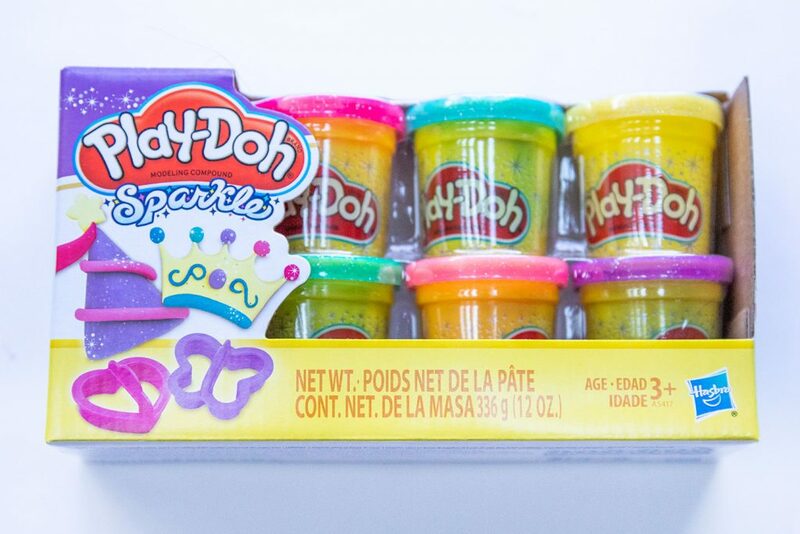 My daughter loves playing with PlayDoh and I found some shimmering glittery ones! I think she is just going to love it! One of my daughter’s favorite days of the week is when we go to Story Time at the local library. I’m so happy she has taken an interest in books and loves being read to. 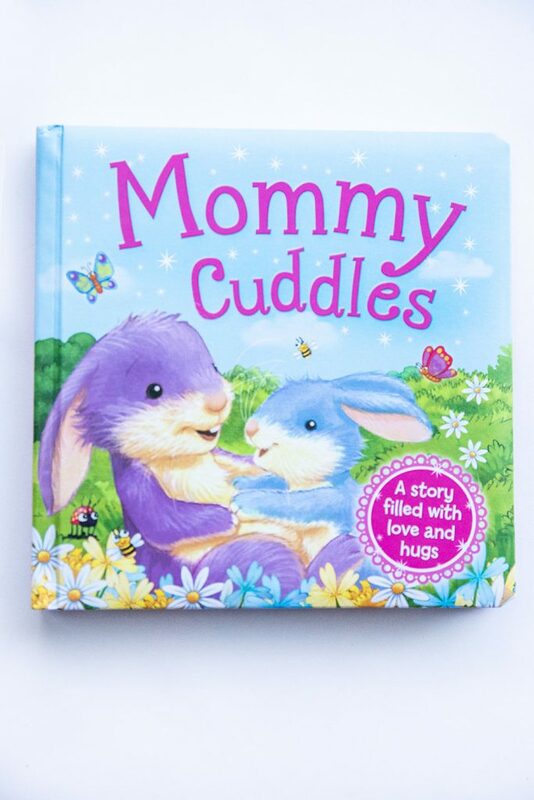 I couldn’t let her Easter Basket be devoid of books! 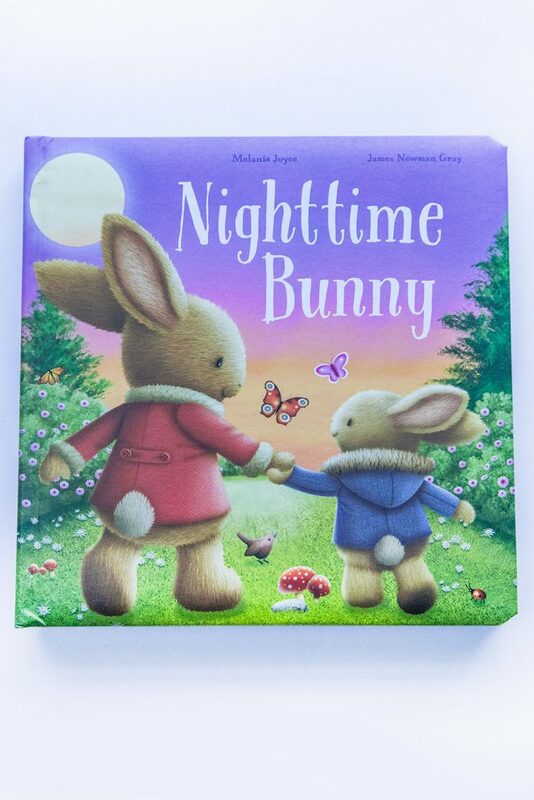 I found these cute little Bunny Books at Aldis! Being that both my husband and I are both artists and very creative, it doesn’t surprise me in the least that my two-year-old has developed quite a passion for the arts already. Besides being completely obsessed with coloring, she is actually starting to color within the lines. Pretty proud mommy moment! 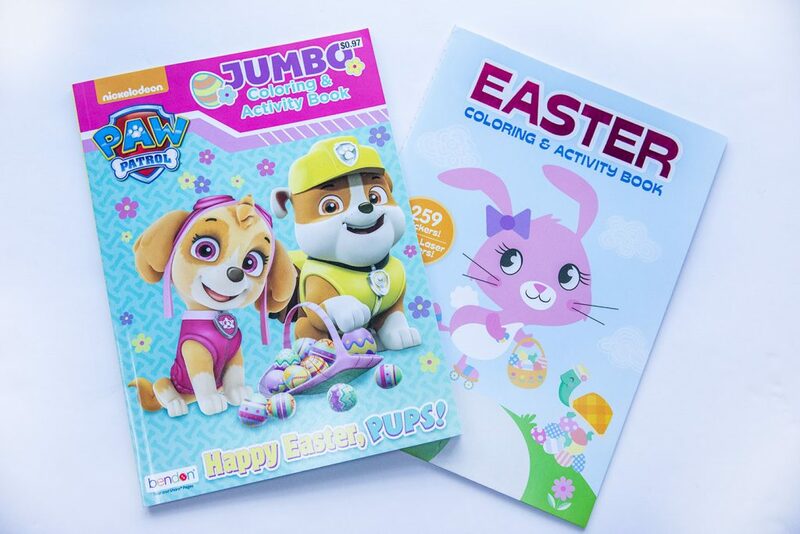 Needless to say, I included some new coloring books in her basket. 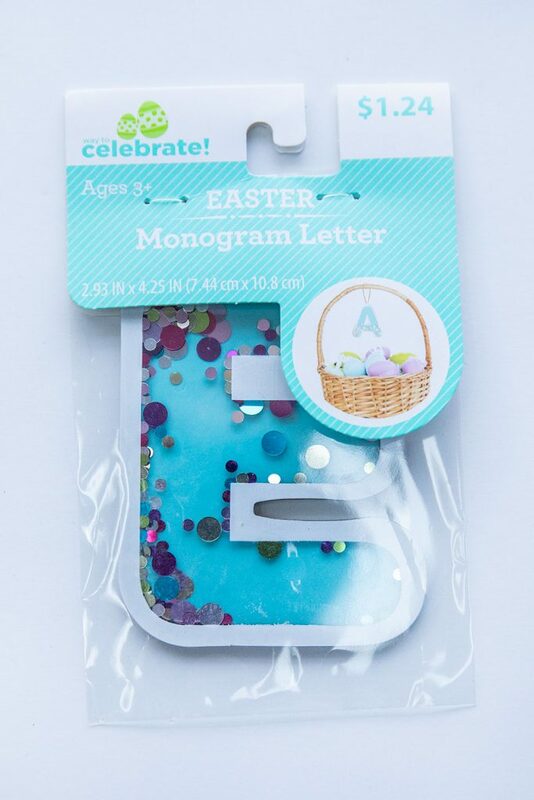 This cute Easter Monogrammed Letter I found at Walmart is perfect for families with more than one child, so you can keep up with whose basket belongs to who! 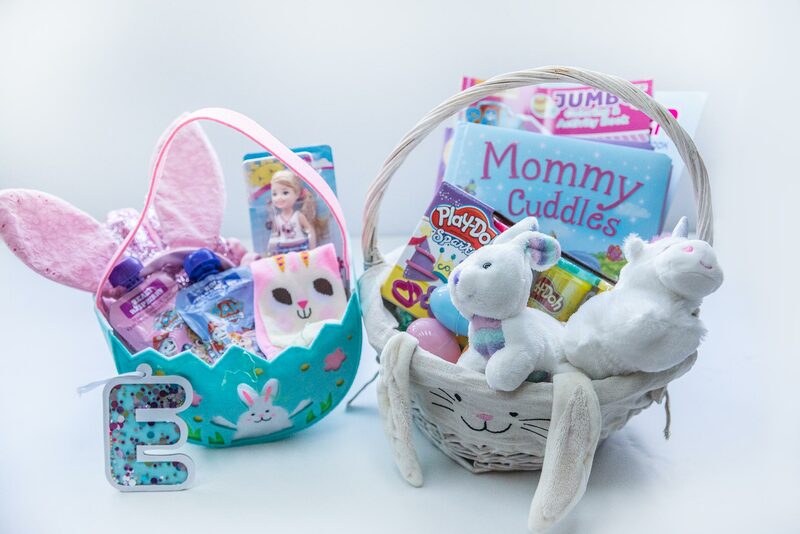 So our main Easter basket is a little small, – so I did two little baskets this year. Here they are all made up! Interested in some of these items?! Click here to purchase some & see other fabulous ideas! 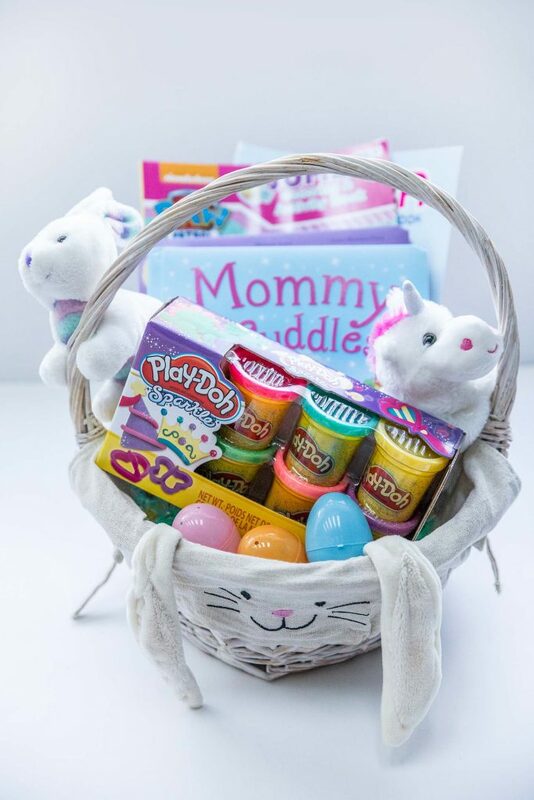 What are some items you include in your Easter Baskets? Disclaimer: This post may be sponsored or contain affiliate links, which means I may receive a small commission, at no cost to you, if you make a purchase through a link.